An e-mail from Tim Eyman ten days ago caught my attention. Eyman wrote about something Fairley had said while presiding over a hearing as chairwoman of the State Senate committee on government operations and elections. The hearing was about a bill to define signatures on initiative and referendum petitions as public records. After the February 2 hearing, Eyman sent Fairley (D-Lake Forest Park) an e-mail disputing her statement that Eyman had copied signatures on two petitions. Eyman asked Fairley to correct the record. When I asked Fairley about Eyman’s e-mail, she told me she hadn’t read it, understandable since Eyman’s e-mails arrive almost daily. Fairley explained that someone in the secretary of state’s office had told her that the office had given Eyman two years' worth of initiative and referendum petitions. The Shoreline Community College Baseball Team used local high school graduates to help lead the team to an opening day sweep of Vancouver Island College (Canada) on Saturday at Lower Woodland Park at the south end of Green Lake. The Dolphins posted identical 7-0 victories for both games. Former Shorewood High School product, Brady Summers (pictured), was the winning pitcher in the first game, striking out 4 and allowing 3 hits for the Dolphins. In the second game, Willie Davies, a former Shorecrest High School pitcher posted the win while striking out 8 and allowing 3 hits as well. Carol Solle's comparison of auto liability insurance and healthcare insurance is not apt. A fairer comparison would be emergency services (911) to healthcare, because in the aftermath of an accident the prime concern is taking care of injured people, whether or not those people can pay. I don't know of a single location where 911 services are provided privately. This is because it makes no sense. However, once the insurance system kicks in, when the injured party has reached the hospital and critical needs are taken care of, everyone has horror stories to relate about medical care which was second-guessed, delayed or rejected by insurance companies - and this isn't even health insurance, but the auto liability companies. Solle advocates for allowing interstate purchases of insurance. I would have no problem with this, so long as there is very strict federal-level regulation of benefits and premiums, and a requirement that everyone be included in the same insurance risk pool. However continuing state-based regulation would be overmatched by the power of the insurance companies, and states would compete to attract the insurance companies by minimizing requirements, as has happened with the credit card industry. This would lead to even less accountability than we have now. Why can't the United States, the most powerful and wealthiest nation in the history of the world, provide adequate health care to everyone who lives here? Other wealthy countries around the world are able to do this. Systems vary. Some are government-run, and some, such as Japan's, are run by very strictly regulated private insurance companies. But they are able to do what we cannot, which is to take care of all their citizens (and visitors - my mom received health care recently on a trip to London, when she fell on a bus) whether or not they are rich, poor, working or unemployed. The pairings are set for the NWAACC Men's Basketball Championship. The Dolphins will face Green River Community College in the first round of the NWAACC Men's Basketball Championship. If SCC wins, they will face the winner of the Community College of Spokane or Clackamas Community College from Oregon in the second round. Shoreline finished the season 19-5 overall, 13-3 in the NWAACC Northern Region and will be the #1 Seed from the Northern Region. 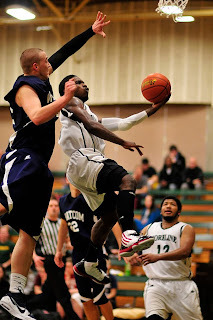 Green River was 13-11 overall, 10-6 in the NWAACC Western Region and the #4 Seed from that division. The CC of Spokane is 21-5 overall and the #3 Seed from the Eastern Region, while Clackamas is also 21-5 and the #2 Seed from the Southern Region. SCC will face Green River at 6 pm next Saturday, March 6, in the Toyota Center in Kennewick, WA. If the Dolphins win, they will play again at 6 pm on Sunday. If SCC loses, they will move to the consolation bracket and play at Noon on Sunday against the loser of Spokane/Clackamas. This is the first trip to the NWAACC Championship for Shoreline in five years and the first region championship since 2001-02. The NWAACC Men's Basketball Championship is a 16 team tournament, with the top four teams from each of the conferences four regions comprising the bracket. To win the NWAACC Championship, a team must win four games in four days. The NWAACC Women's Basketball Tournament is played at the same time at the same location as one men's game is play next to one women's game on the arena's floor. The Driftwood Players announce theatre auditions for their world premiere of a new play by local Northwest playright Jeff Stillwell. The play is called Teacup Tipsy and it will be directed by the playwright. Auditions will be held on Sunday, March 14 from 3 pm and Monday, March. 15 from 7 pm at the Driftwood Administrative Office, 306 Main Street, Edmonds. There are parts for men (30's to 50's) and women (20's, 50's to 60's). Additional character information and a sample script are available on the Driftwood Players website. Prepare a short, contemporary monologue and bring picture and resume. Sign up for an audition appointment online or call 425-774-9600. Teacup Tipsy performs April 17, 18 and 19. Saturday at 2 pm; Sunday and Monday at 7:30 pm, at the Wade James Theatre, 950 Main St, Edmonds. Shy and mousy Reginald tries desperately to attract the notice of the beautiful Lyla (if only she'd stop dancing!) through winning a mug of tea on the house by reciting "St. Theresa's Teacup Tipsy" (five times, fast)! However, his hapless stutter, the miserly grousings of Mrs. Widdershins, and the iambic pentametered exhortations of the Man in the Box all keep getting in Reginald's way! Enjoy this wacky, heart-warming comedy about love, loneliness, and the lengths to which we go to live out our dreams! Come Play a Part at The Driftwood Players. Community Theater by and for the community. The Edmonds Driftwood Players is celebrating its 51th season. We bring quality live theatre entertainment to our community. Our volunteers include actors, directors, crew, set designers, ushers, set builders, office support staff, and many, many more. Sophomore Ryan McCorkle celebrated his final home game by scoring a lay-up with 3 seconds left to lift the SCC Men's Basketball Team to victory against Everett Community on Saturday at the SCC Gym. Shoreline won the game 98-96 as Sean Jones (left) scored 23 and Sophomore Shawn West (right) added 20 to led SCC to victory. Alfie Miller-Soukasen and Ryan McCorkle added 15 points each while McCorkle pulled down 11 rebounds and Jesse Vaughan 13 points as SCC used a balance attack to win the game. The teams were tied at half-time, 53 each and both teams battled in the second half, with neither team gaining an large advantage. 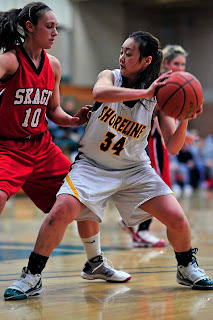 Shoreline is 19-5 overall and 13-3 in the region, winning the division by 2 games. The Dolphins will represent the Northern Region as the #1 seed for the division in the NWAACC Men's Basketball Championship next weekend. Everett finished the season 6-18, 4-12 in the region. Shoreline opens play in the NWAACC Championship at 6 pm on Saturday, March 6, against the #4 seed from the Western Division. The SCC women's basketball team finished the 2009-10 campaign with a loss to Everett Community College on Saturday afternoon in the SCC Gym, 61-48. The Dolphins and ECC were tied 8-8 but the Trojans pulled ahead by 17 late in first half and led at half-time 31-19. Shoreline pulled within 8 points a couple of times in the second half, but could close any further. Ana Haberman (left) scored 27 points in her final game, as she finished the season the #1 scorer in the NWAACC Northern Region. Lynsey Sandum (right) added 10 points and 8 rebounds for SCC as well. Shoreline finished the season 3-21 on the season, 2-14 in the region. Everett goes on to the NWAACC Women's Basketball Championship in Kennewick, WA next weekend. The Lady Trojans are 16-9 overall, and 12-4 in the region. On comparing car and health insurance, and advocating competition: Car ownership is voluntary, accidents are rare for good drivers, and good driving can be learned. It makes sense for there to be differences in premiums for good and bad drivers, and for degrees of coverage. Illness is involuntary and universal, and can’t be unlearned except for lifestyle changes like smoking and overeating, which are a good idea but not a panacea. Competition in the market leads to cherry-picking, where healthy and young people choose cheap insurance or none at all, while older and less healthy people are forced to pay more or are denied coverage altogether. They often then end up being treated as indigents, their costs being passed on to the rest of us as higher doctor and hospital overhead and higher insurance premiums. This is why coverage should be universal. Car insurance is, after all, for those who choose to drive, and for good reason. On mandates: If mandates are not imposed, insurance companies can simply refuse to cover expensive treatments, like cancer treatments. Obviously, those companies’ premiums would be cheaper, and people who wanted to gamble on not getting cancer would opt for them. But when some of those people did get cancer, they would probably end up being treated as indigents, as above. On Health Savings Accounts and high deductibles: These mostly benefit the well-off who can take a tax deduction for HSA contributions and can easily afford out-of-pocket expenses. Lower-income people don’t make enough to itemize deductions, so HSAs are useless to them. And high-deductible plans can backfire if they discourage people from getting preventive care , (like mammograms), leading to more expensive remedial care later. On tort reform: Torts only make up about 2% of health costs nationally, so tort reform would have a minuscule impact on health costs. Doctors have a financial incentive for performing needless tests, because they get paid for doing them. And malpractice insurers have a financial incentive to whine about tort reform, because what’s 2% of total health costs is 100% to them. On “the government taking control of 17% of the GDP:” The reason our health care system takes up 17% of GDP is that it’s dominated by private industries that are making higher profits than most of the rest of our economy. The socialized British system takes about half as much of Britain’s GDP. And the British have longer life expectancy and less child mortality, probably because poor people there get health care paid for by universal taxes. On “cutting $500,000,000,000 from Medicare:” Medicare and other federal health spending amount to a full half of US health spending, but there are industry-protecting laws preventing the government from using this potential bargaining power to force down costs. These programs could, indeed, bankrupt the federal government. But there are only two ways of cutting costs – cut services or cut private profits. Take your pick. The British system sounds pretty good to me. The Shorewood girls’ basketball team’s run in the Northwest District 4A basketball tournament ended two games short of a State tournament bid. 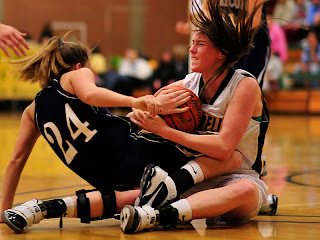 The Thunderbird girls’ season finished Tuesday, February 23 with a 50-28 loss to Edmonds-Woodway. E-W broke the game open by shutting Shorewood out 19-0 in the second quarter. 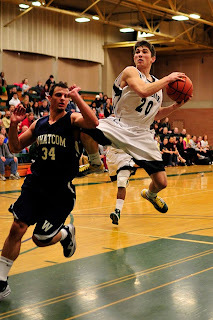 Edmonds-Woodway went on to defeat Arlington Friday February 26 for the District’s third spot in the State tournament. The loss left the T-birds with an 8-16 season record. Junior Lisa Echert, senior Mallory McDonald and freshman Masha Shtikel led Shorewood against Edmonds-Woodway with 6 points each. Shorewood Scoring—Fasbender 2, Godfrey 2, Echert 6, Lindgren 0, Hasegawa 0, McDonald 6, Nephew 2, Ellersick 3, Holley-Lair 1, Shtikel 6, Franklin 0. It's time for the ACATEMY Awards! The Seattle Humane Society is rolling out the red carpet for its elegant "tuxedo" cats in celebration of the 2010 Academy Awards. As our gift to the community, adoption fees will be waived for all black and black & white tuxedo cats 1 year and older March 6-7. These elegant felines have been spayed/neutered, microchipped, vaccinated and health-checked. They will go home with a full month of health insurance and a certificate for a free health exam. 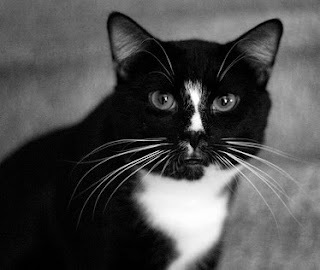 "Elegant black cats and sleek tuxedo cats never go out of style," says CEO Brenda Barnette. "Our cats have winning personalities of Oscar-worthy proportions and we want everyone to have a chance to meet these fabulous felines." Classy cat companions are waiting behind the velvet rope at the Seattle Humane Society today, located in Bellevue at 13212 SE Eastgate Way. The adoption center is open seven days a week from noon until 6 pm. 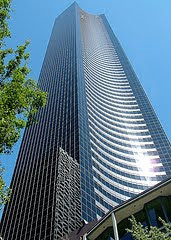 On March, 7, eight firefighters from Shoreline will race up 69 floors of the Columbia Center in Seattle to benefit the Leukemia and Lymphoma Society. The annual Scott Firefighter Stair Climb features firefighters from all over the world as they climb 1,311 steps in full bunker (combat) gear and Self-Contained Breathing Apparatus (SCBA), weighing over 50 pounds. This year, the Shoreline team will be climbing in honor of Theron Gibb, father of Shoreline Fire’s Captain Bryan Gibb. Theron, a retired Seattle firefighter is currently battling leukemia. The Shoreline team also climbs in honor of cancer survivor, Mick Lamar, who is Shoreline firefighter Jason Lamar’s dad. Mick is also a longtime fire service employee. The Firefighter Climb raises money for the Leukemia and Lymphoma Society, as well as for the honorees that teams select. Shoreline’s team of eight includes firefighters Troy Crossley, Mark Peterson, Andy Holstad, Jared Linke, Steve Anderson, Scott Kim, Brett Defenbaugh and Andrew Morehouse. 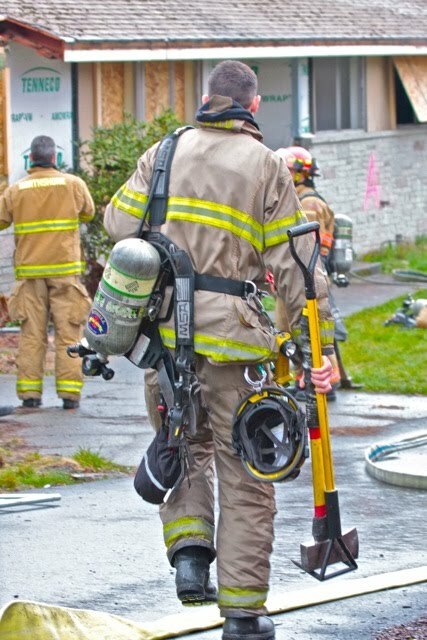 The Firefighter Stair Climb was started years ago by Shoreline Firefighter David Engler – who climbed the tower in full bunker gear during the civilian event. The firefighter event now typically draws over 1000 firefighters and raises thousands of dollars each year. 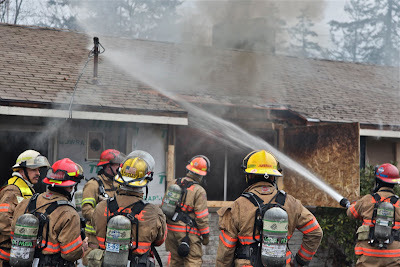 Shoreline Firefighters Union Local 1760 volunteers have staffed the event since the beginning—and will be out in full force this year alongside hundreds of Leukemia and Lymphoma Society volunteers who make the event possible. In addition to the Firefighter Climb, the “Big Climb” takes place on March 21 and is open to the general public. Check the webpage for more information. The Shoreline-Lake Forest Park Senior Center was recently honored as a Community Friend by Friends of Third Place Commons in Lake Forest Park. "We've worked with the Senior Center from the beginning (of Third Place Commons) and in this last year have stepped up that working relationship. Not only is the Senior Center one of our partner agencies in the Market Bucks Program, it has become a vital partner in moving beyond weekly Mah Jongg and into some public outreach programming in the Commons." The Senior Center is located at the Shoreline Center, 18560 1st Ave NE in Shoreline. Hours of operation: Monday through Friday, 8:30a.m. to 4:40p.m. ; 206-365-1536, or email. The center offers over 50 classes weekly, including over 11 exercise class options, a daily hot lunch and 26 special services for seniors and their families. THANK YOU to the citizens of Shoreline and Lake Forest Park for your strong support of the three ballot measures on February 9. With the passage of the four-year Levy for Educational Programs, Maintenance and Operations, and the four-year Capital Levy for Technology Improvements and Support, the Shoreline Schools will be better able to meet the ever-changing, complex learning and support needs of our students and families, while continuing to offer a comprehensive educational and extracurricular program in the years ahead. The passage of the Bonds to Modernize/Replace Shorecrest and Shorewood High Schools marks an exciting milestone in the history of the District. We are thrilled for our students and entire community that the Shoreline Schools will be able to provide safe, secure and 21st century high school facilities to serve our students and community for many years to come. The sixty-five member Shoreline Concert Band, under the direction of Ken Noreen, presents its Winter Quarter concert, “Facets of Love” at 7:30 pm on Tuesday, March 9, at the Shorecrest Performing Arts Center. Tickets are available only at the door. $8 general admission., $6 seniors and students. This special concert features the Shoreline Singers under the direction of Dr. Fred Lokken and the Shorewood High School Wind Ensemble, directed by Brian Akesson. 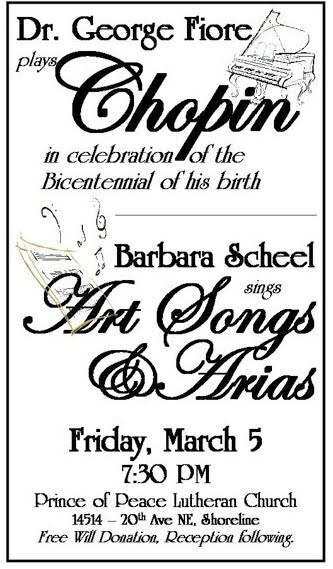 On Friday, March 5, at 7:30 pm at the Prince of Peace Lutheran church, 14514 20th Ave NE, Shoreline 98155, Dr. George Fiore will perform works by Chopin in celebration of the Bicentennial of his birth. Barbara Scheel will sing art songs and arias. Freewill donations. Reception to follow. Fifteen years ago residents incorporated Shoreline as a City so they could receive better, even exceptional, services for their tax dollar. Since then, the City has worked hard to meet residents’ expectations and 15 years after incorporation Shoreline families, neighborhoods and businesses have much to be proud of. Unfortunately, the City’s ability to fund the services that make Shoreline such a great place to live is facing serious challenges. In 2010, Shoreline residents will need to decide how best to maintain the quality of life we have come to enjoy and protect the investments made in our neighborhoods and community. By renewing our investment now we will keep and build on what we have created over the last 15 years. The cost of not affirming our investment jeopardizes many of the services and programs that make Shoreline a “Number One” community in the Seattle region. Come listen to representatives from the City give a brief presentation on services and how the current long-range financial outlook will impact those services. Come ready to ask questions! 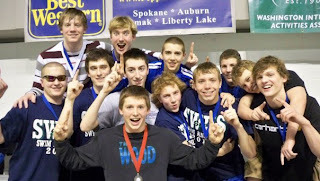 Shorewood swimmer Thor Stenfjord was named State 4A boys athlete of the week for February 14-20. Stenfjord, a junior, won the 100-yard freestyle at the State 4A championships in Federal Way, February 20. He also swam on the winning 200-yard freestyle relay team and winning 200-yard medley relay team. In addition, he finished second in the 200-yard individual medley to help the Thunderbirds win the team championship. Each week, the Washington Interscholastic Activities Association names a boy and a girl athlete of the week in each enrollment classification. Auto Insurance is available from companies across the nation. It provides coverage of varying degrees, depending upon customer preference: Comprehensive or collision, coverage amounts, and varying deductibles. Customers are rewarded for good driving, and those that cause accidents see their premiums go up, or they get dropped from coverage. Auto Insurance covers unexpected liability, while insurance holders are expected pay for routine oil changes, tune-ups, engine repairs and new tires. Most likely, these insurance holders look for the best service at the lowest price, promoting free-market competition. Health Insurance availability is limited to the state in which the insured lives. Each state mandates that certain conditions are covered by health insurance. For example, in the state of Maryland, In-Vitro Fertilization, Morbid Obesity Treatment, Smoking Cessation, Well Child Care, Alcoholism/Substance Abuse and Hair Prosthesis are mandated to be covered. This significantly increases premiums for everyone in Maryland when not everyone needs this type of coverage. Health Insurance is expected to cover not just unexpected healthcare costs, but routine checkups and treatments for common illnesses. The insured is not motivated to look around for the best service at the lowest price, thereby removing free-market competition. (On the other hand, cosmetic and lazik surgery is not covered by insurance, allowing consumers to shop for the best deals, and those costs are going down!) Also, there is no incentive on the part of the insured to restrain healthcare consumption. As a result of state mandates, lack of competition, uncontrolled healthcare consumption and lawsuits, the cost of health care has increased at a greater rate than inflation. Suggestion: 1) Remove state mandates 2) allow interstate purchase of health insurance to provide more competition 3) Allow for Health Savings Accounts (HSA) so that the insured can manage healthcare insurance independent of employment. Typically, HSAs have a high deductible (i.e. $2,500/year) and low premiums. Holders of HSAs are much more likely to be careful consumers of healthcare. 4) Enact Tort reform. Before government takes control of 17% of the GDP and cuts $500,000,000,000 from Medicare, it might be worth exploring less risky paths to real healthcare reform. 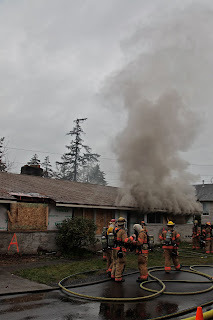 Smoke rises into the sky as the Shoreline Fire department continues a week of training exercises for fire fighters in a house donated by Sky Nursery. 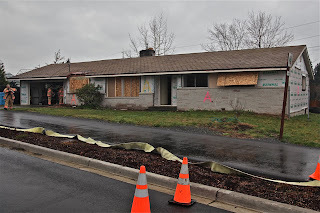 The house is located on the Interurban Trail just north of the Sky Nursery parking lot. Firefighters will do small burns in different parts of the house, then burn it down completely on Wednesday. 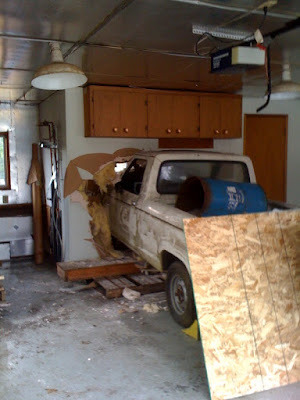 As part of the training opportunities for firefighters, Shoreline Fire set up a scenario where a pick-up truck had crashed into a house and the firefighters have to respond. 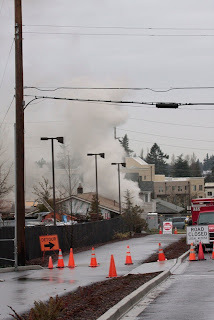 The house was donated by Sky Nursery and is located at the north end of the Sky parking lot, along the Interurban Trail. Training exercises continue all week, culminating in a complete burn on Wednesday. The Shoreline Community College basketball teams finish up their regular seasons on Saturday at the SCC Gym against Everett Community College. The Lady Dolphins play at 2 pm and the men’s squad at 4 pm. The SCC women’s team will finish their season after a disappointing year of injuries. The Lady Dolphins are 3-20 on the season, 2-13 in the NWAACC Northern Region. The team lost starting center Amber Herring before the season even started and then lost starting forward Ashley Fleming after 3 games. Freshman transfer from Linfield College, Ana Haberman, has led the team, averaging 21+ points a game and Lynsey Sandum, a freshman work-on has developed during the year, averaging over 12 points a game during the region schedule. The SCC men’s basketball team is coming off a great year, as they have won the NWAACC Northern Region for the first time in 8 years and will represent the college at the NWAACC Men’s Basketball Championship in Kennewick, WA next weekend. The Dolphins are 18-5 on the season, 12-3 in the region. The SCC team will play the #4 seed (either Pierce or Green River Community College) from the NWAACC Western Region in the first round of the NWAACC Tournament on March 6, at 6 pm in the Toyota Center in Kennewick. The Dolphins are led by freshman, Jesse Vaughan and sophomore, Shawn West, who average 16.36 and 15.24 respectively. Freshmen Alfie Miller-Soukasen (14.06) and Sean Jones (13.69) are both averaging in double figures as well. The team will honor sophomores Shawn West (photo on right) and Ryan McCrokle (photo on left) pre-game on Saturday as well. Admission is $5.00 for adults, $3.00 for Seniors and non-SCC students and SCC students are admitted free. The Shoreline Community College Baseball Team leads off its season this weekend at Lower Woodland Park, the SCC home field. The Dolphins are coming off a building year of 16-24 in 2009 after finishing 5-35 in 2008. The SCC squad started the 2009 campaign 10-0 before injuries took its toll on the team and the Dolphins went 6-24 the rest of the way. Shoreline faces Vancouver Island College (Canada) on Saturday, February 27, at 3 pm at Lower Woodland Park (south end of Green Lake) in a double header and then plays Pierce Community College on Sunday for two games starting at Noon also at Lower Woodland Park. The Dolphins are led on the mound by sophomores Travis Shigeta from Kapaa High School in Hawaii and Willie Davies, a local product from Shorecrest High School. Freshmen Michael Kenui, from Waiakea High School, Hawaii and Nico Vanderven (Ballard High School) add pitching depth to the starting rotation. Offensively, the Dolphins will be led by Bryson Nakamura, a sophomore outfielder from Pearl City High School in Hawaii. Transfer sophomores Lakota Holder and Andrew Hutt provide more offensive punch to the line-up. Admission is free to SCC Baseball Games. The Gallery at Towne Centre, on the lower level of the LFP Towne Centre, presents a new show with artwork by Amy Pleasant and Betsy Best-Spadaro. The exhibit will run from March 4 to April 12, 2010. The artist open house is Thursday, March 11, from 5-7 pm. Spring is coming! The days are getting longer and March announces the end of winter. Come celebrate with us and drink in some bright, colorful artwork by Amy Pleasant and Besty Best-Spadaro. Join us on Thursday, March 11 from 5-7 for a special artist open house for an opportunity to meet the artists, ask questions about their art and enjoy some refreshments. The journey to painter has been a crooked path. 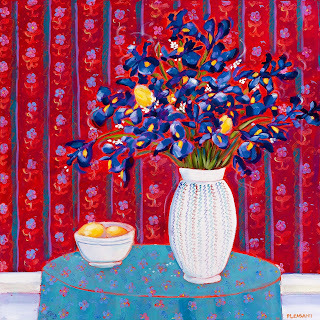 Although I have filled my life with art, both admiring it and producing it, I did not start painting until 2000. My vocation as a middle school teacher was interrupted with a faint call in the direction of my dreams. My paintings became my own language; a visual language, surely influenced by those who came before, but sill uniquely me. 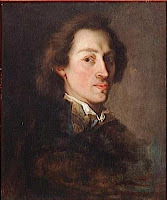 For the painter this expression becomes as much a part of life as talking and listening. It is all the more rewarding if others share in the emotion which brought about the work in the first place. I’ve spent 20 years raising children, all the while fitting “artist” into the mix of diapers, housework, bedtime stories and the PTA. Even my medium, relief printmaking, was chosen for the ease with which it blended into domestic life. I learned early on that while supervising homework it is much easier to stand at the kitchen counter and carve a block than to be out in the garage working on a canvas. My artist work reflects what I have experienced and observed in my every day life. 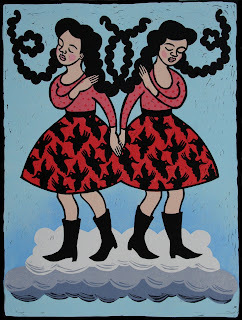 In my relief prints I’ve explored the balance between obligation and desire, power struggles in intimate relationships, the lengths to which one will go to create security or suppress guilt, the joyous uncertainly of raising children. In my work I hope to leave a viewer with a sense of shared experience as well as a heightened awareness of the roles we play. The Shoreline-Lake Forest Park Arts Council is a 501(c)(3) nonprofit organization whose mission is to nurture all of the arts in the community through programs and events, arts education, advocacy, and support for artists and arts organizations. Proceeds from the Gallery at Towne Centre help fund these programs and events. For more information please contact the Arts Council at 206-417-4645 or visit us online. Vision House: Jacob's Well is a project to build a transitional housing facility in Shoreline for homeless mothers and their children. Property has been purchased in the Ballinger area, the design is complete and the permits are in hand. The complex will consist of 20 housing units, on-site child care for 65 children and counseling offices for families who need extra support. The Jacob's Well Service Center will also provide space where volunteers and local churches can come together to support the resident families along side the professional staff. To learn how you or your church, company, or community group can get involved, come to an informational meeting on Thursday morning, March 4, from 7 - 9 am, on the Crista Campus, Schirmer Auditorium at King’s High School at 19303 Fremont Ave N, Shoreline, WA 98133. Parking on Greenwood Ave N.
For more information, contact Gary Kingsbury, 206-962-1496. 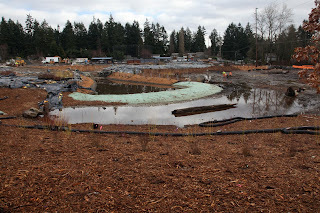 On Saturday, March 6, from 9 am to 1 pm, rain or shine, a planting party will take place at Cromwell Park, N 179th and Meridian Ave N, Shoreline 98133, to install native plants to the wetland areas of the park. Volunteers from the February work party at Cromwell Park. Volunteers are welcome and would join workers from the City of Shoreline, the Meridian Neighborhood Association, Richmond Little League, Hillwood Soccer and EarthCorps in an effort to revegetate the wetland and natural areas of Cromwell Park as part of the King County Waterworks and Youth Sports Facility Grants. Participants should plan on wet weather and a muddy site. Tools and gloves will be provided. Parking available at Metro Commuter parking lot at Zion Presbyterian Church driveway, 17920 Meridian Ave N. To access site, head east on N 179th. Park entrance is on the north side of the street. For more information, contact Chris LaPointe, Earth Corps Volunteer Program Manager, 206-322-9296, ext. 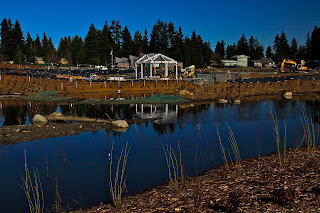 217, or Maureen Colaizzi, City of Shoreline Parks Project Coordinator, 206-801-2602. 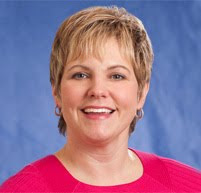 Shoreline City Councilwoman Shari Tracey will hold an informal “coffee hour with constituents,” Saturday, February 27 from 9:30 to 10:30 am at the Top Foods cafe, near the fireplace. Tracey says that it is an opportunity for citizens to let her know what is on their minds. She says that people who can’t make it can send comments to her by e-mail or leave a voicemail at her city phone number, 206-801-2201. Tracey says that people will have to buy their own coffee and that State law prohibits anyone from buying hers. She adds that council members can’t discuss quasi-judicial matters like the Crista Master Development Plan. Constituent comments on such matters must be in the Planning Commission’s record. Shorecrest High School's boys and girls basketball teams have both qualified for the Northwest District 1 basketball tournaments. 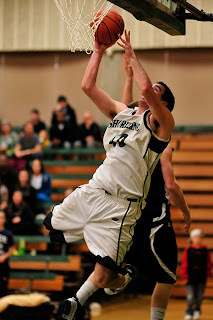 The Shorecrest boys lost to Ferndale on Tuesday and will play Everett in a loser-out game on Friday, February 26 at 6 pm at Glacier Peak High School in Snohomish. The Shorecrest girls defeated Sedro-Wooley on Wednesday in the first round of the District 1 tournament, and next play Ferndale on Saturday, February 27 at 8 pm at Glacier Peak High School in Snohomish. The Shorewood boys lost to Cascade in a loser-out game on Wednesday, ending their season. 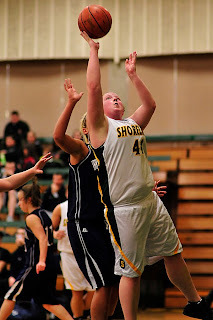 The Shorewood girls lost to Edmonds-Woodway in a loser-out game on Tuesday, ending their season. The Lady Dolphin Basketball Team won its second NWAACC Northern Region game of the year by defeating Peninsula College 59-51 in Port Angeles, WA. The SCC squad was led by Ana Haberman and Lynsey Sandum with 29 and 20 points respectively. Sandum hit her season high in the game. Catilyn Johnsen pulled down 9 rebounds in the game as well. 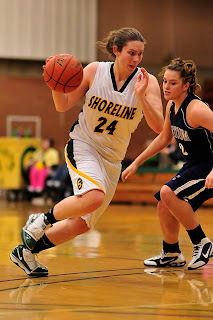 Shoreline took a 29-22 lead at halftime and matched Peninsula in scoring in the second half to take the win. The Lady Dolphins are 3-20 on the season, 2-13 in the region. 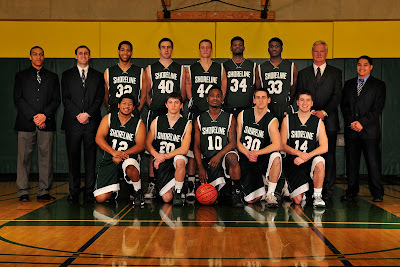 Shoreline finishes their season on Saturday against Everett Community College at 2:00 PM in the SCC gym. SCC will honor 3 sophomore players at the game. 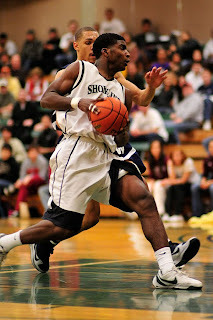 The Shoreline Community College Men's Basketball Team lost to Peninsula College on Wednesday night in Port Angeles, WA, 94-87, but won the NWAACC Northern Region as Whatcom CC lost to Skagit Valley as well. SCC leads the region by 2 games with one game to go. Shoreline led at half-time 42-34, but Peninsula outscored the Dolphins 60 to 45 in the second half to pull away from the SCC squad. Shoreline was led by Alfie Miller-Soukasen with 22 points (6 for 11 from 3 point range) and Jesse Vaughan with 19 points. Spencer Wozeniak added 14 points for the Dolphins as well. 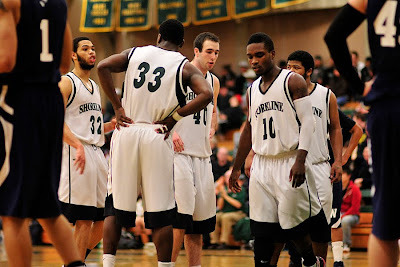 Shoreline is now 18-5 on the season and 12-3 in the Northern Region. The Dolphins finish the regular season on Saturday at home against Everett Community at 4 pm. Shoreline will honor two sophomores at the game, Ryan McCorkle and Shawn West. The SCC Men's Basketball Team moved up one spot in the final NWAACC Men's Basketball Poll to the #7 spot. The Dolphins had held the #8 spot in the poll the past two polls after starting the season unranked. The Dolphins are 18-4 on the season, 12-2 in the NWAACC Northern Region and have clinched the #1 seed for the region. They will open play in the NWAACC Men's Basketball Championship on March 6 in Kennewick, WA against the #4 seed from the NWAACC West Region.